You can run or stop all robotic vacuum functions. 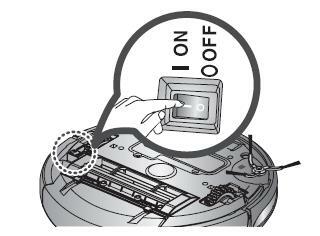 Each robotic vacuum function only runs when the power switch is turned on. When the robotic vacuum is operating press the Start/Stop button to cancel the operation and select a function. Press the Power button on the remote control or press the Start/Stop button on the robotic vacuum cleaner. The main unit's battery level indicator and cleaning mode icons will light up. 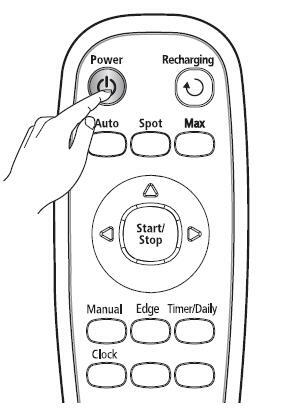 Via the remote control: Press the Auto, Spot, Max, Manual or Edge buttons. Main unit: Cycle through Auto, Spot, Max, Manual and Edge modes by pressing the button and then press the button when the vacuum cleaner displays the mode you want. When cleaning begins the robotic vacuum cleaner will start to move. Pressing the Start/Stop button without selecting a cleaning mode will cause the vacuum cleaner to use Auto mode. To stop a clean in progress press the Start/Stop button on the vacuum cleaner or the Power button on the remote control. When cleaning is stopped the robotic vacuum cleaner will stop moving. Press the Power button on the remote control or press and hold down the Start/Stop button for three seconds on the robotic vacuum cleaner. All icons except for the battery level indicator will turn off.